One of our favorite family vacation spots is a resort in Hawaii, The Manua Lani. They offer a daily breakfast buffet that has amazing juices. Our preteen would actually wake up early just to get down to breakfast and have juice and of course fresh pastries and tons of bacon. However, when you ask him what his favorite thing about the resort was he always says snorkeling and guava mango juice! 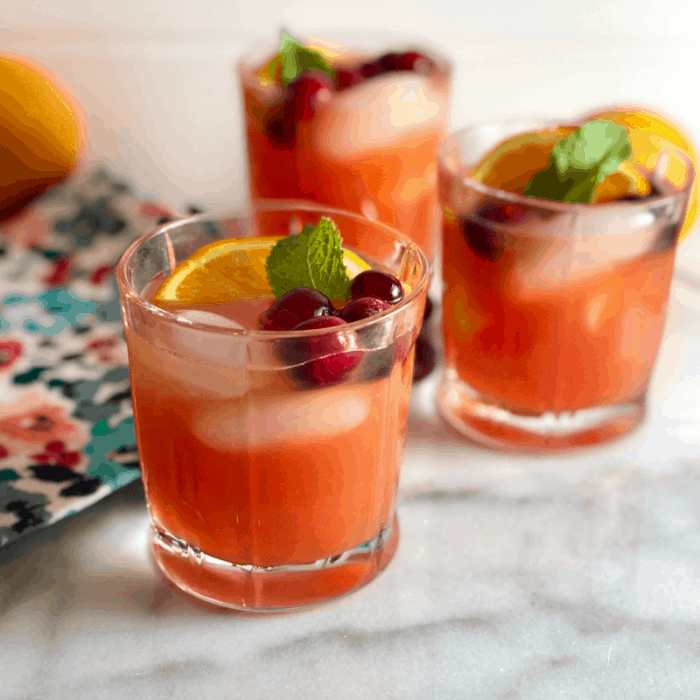 This yummy Mango Guava Cranberry Juice recipe was created to keep these memories alive. This mocktail will be kept in our family recipe collection as a wonderful memory of Hawaii trips. Memories like the rustle of palm trees, sunsets, kind island people and fabulous food. 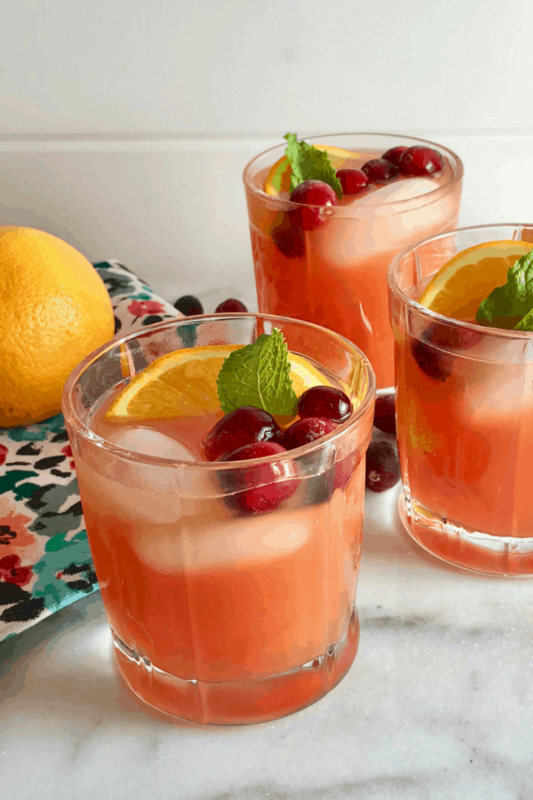 Our recipe adds cranberry juice and mint garnish. I use Cape Cod Select frozen cranberries as a colorful garnish. Cape Cod frozen cranberries are available year-round and add an amazing layer of flavor to so many dishes. 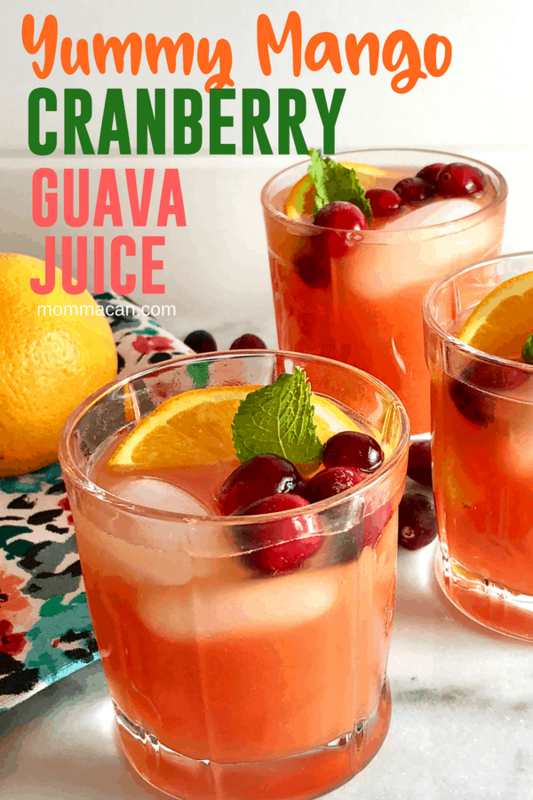 Wonderfully yummy mango guava cranberry juice is the perfect breakfast beverage or serve it as a mocktail at your next dinner party! Add three juices to an 8 to 10 cup glass pitcher. Stir. Add two leaves each of mint to bottom of an old-fashioned glass. Add a few cubes of ice and fill the glass with juice leaving an inch to the top of the rim. Garnish with a sprig of mint and a few frozen cranberries for color. Serve Immediately. You can kick the mocktail up to cocktail with lemon vodka or good rum. Enjoy! This drink looks so refreshing. I laughed at your son’s comment about snorkeling and this guava mango juice drink. Sharing your recipe on Pinterest! Living in Miami, this drink is perfect for me for summer entertaining. Pinning for reference! This really looks like such a refreshing drink Pam!